Centaurea akamantis T. Georgiadis & Hadjik. 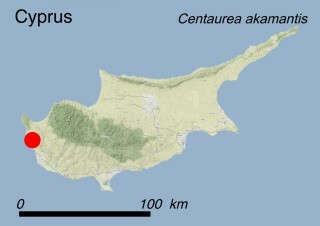 The three known subpopulations of Centaurea akamantis are located within the Akamas Peninsula in the north-western part of Cyprus. Centaurea akamantis colonizes steep and humid limestone cliffs in three neighbouring gorges, between 75 and 150 m a.s.l. (habitat 6.2: Inland cliffs. Rock pavements and outcrops). Centaurea akamantis is a semi-woody herbaceous plant (= subshrub) with drooping shoots up to 60 cm long. Its leaves are alternate and compound, divided either once or twice. The greyish-green leaflets are linear or spear-shaped, 1-5 mm wide and covered with white matted hair. The small purple-mauve flowers are densely grouped in terminal flower heads that resemble large solitary flowers. The outer flowers of each inflorescence are ligulate, i.e. bearing a single large petal, while the inner flowers are tubular and more inconspicuous. The fruits (achenes) look like the seeds of wheat and bear a bunch of fine hairs, which help wind dispersal. The species flowers from May to November, producing fruits that ripen between July and December. Centaurea akamantis is characterized by an extremely long-lasting flowering and fruiting period. This species has been categorized CR (Critically Endangered) according to IUCN Red List Criteria B1ab(iii)+2ab(iii). When using a 1×1 km grid the species has an estimated EOO of 7 km2 and an AOO of approximately 1 km2. Whilst the known number of mature individuals has increased since a new subpopulation was discovered in 2012, the habitat quality of the plant is inferred to be declining as a result of grazing (threat 2.3.2: Small-holder grazing, ranching or farming) even though it is not permitted in these areas and penalties are imposed by the Department of Forests. Overgrazing in turn enhances local soil erosion processes (threat 7.3: Other ecosystem modifications), already intense due to the intrinsic geology of the gorges where this plant is found. The total population size is 800 individuals (2013 census). The subpopulations are isolated from each other and if one of them disappears it is unlikely that its habitat will be colonized by seeds coming from the other subpopulations. Legally: This species is protected by the Bern Convention, where it is listed in Appendix I, and by the 92/43 EC ‘Habitats’ Directive, where it is included as a priority species in Annexes II and IV. The species is included in the Red Data Book of the Flora of Cyprus as Endangered. The largest subpopulation of C. akamantis, located in Avakas gorge, was designated as a Plant Micro-Reserve by a Ministerial decree in 2013, under the Cyprus Forest Law. In situ: The entire population of this species occurs in the Akamas State Forest, which is under the supervision and management of the Department of Forests, and within the Natura 2000 site “Chersonisos Akama” (CY4000010). Monitoring activities took place between 2010-2013 within the framework of a LIFE+ project (LIFE08 NAT/CY/000453 - Establishment of a Plant Micro-Reserve Network in Cyprus for the Conservation of Priority Species and Habitats). Moreover, specific conservation measures have been carried out in the Avakas Gorge for the reinforcement (through plantations) and the protection (through fencing) of the local subpopulation. Ex situ: Seeds of C. akamantis from the subpopulation located in the Avakas Gorge have been collected and are stored in the seedbank of two scientific institutions located in Nicosia: the Nature Conservation Unit of Frederick University and the National Seed Bank of the Agricultural Research Institute of Cyprus. The species has been successfully cultivated at the Agricultural Research Institute of Cyprus, the nurseries of the Department of Forests and at the Royal Botanic Garden of Kew and planted in the Akamas Botanical Garden. In situ: The Akamas State Forest is expected to be declared as a National Forest Park within 2016. Ex situ: Wild seeds issuing from each subpopulation need to be collected and stored in seedbanks in order to maintain the present gene pool diversity.